Study for the CIA Exam to develop mastery of the knowledge,skills, and abilities you'll be tested on with Wiley CIA ExamReview 2014 Focus Notes, Part 2. Developed to be a precise,easy-to-use resource, this study guide covers Internal AuditPractice and is organized in the same manner as the Wiley CIAExam Review topics. Use the portable, spiral-bound, flashcardformat to study anywhere you go and to quickly and efficientlygrasp the vast knowledge base associated with the exam. 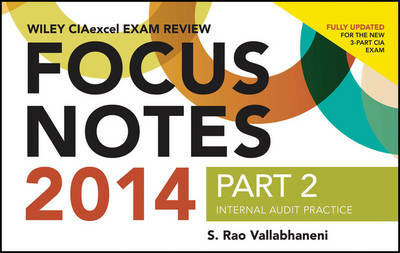 Expert author S. Rao Vallabhaneni puts his twenty-five years ofinternal auditing and accounting management experience to work tobring you hundreds of outlines, summarized concepts, and usefultechniques to help hone your CIA Exam knowledge and pass the testyour first time out.